Home Government Contact Number Government Contact Number in NCR. Government Contact Number in NCR. Metropolitan Manila commonly known as Metro Manila, the National Capital Region (NCR) of the Philippines, is the seat of government and the most populous region of the country which is composed of Manila, the capital city of the country, Quezon City, the country's most populous city, the Municipality of Pateros, and the cities of Caloocan, Las Piñas, Makati, Malabon, Mandaluyong, Marikina, Muntinlupa, Navotas, Parañaque, Pasay, Pasig, San Juan, Taguig, and Valenzuela. 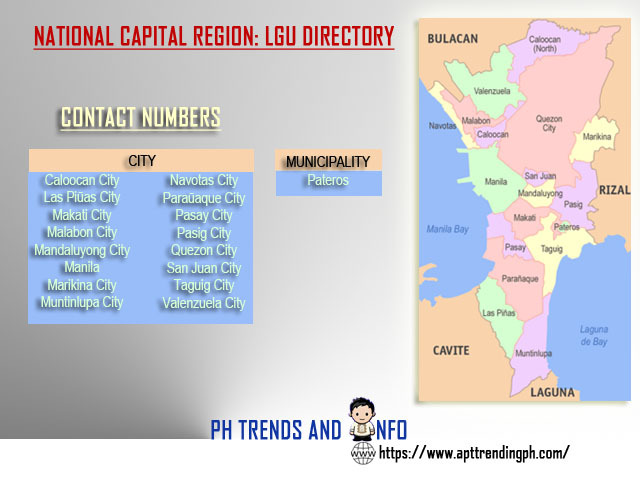 NCR has a population of 11,855,975, making it the most populous region in the Philippines, as well as the 7th most populous metropolitan area in Asia. Vice Mayor: Antonio Suva, Jr.
Vice Mayor: Ricardo S. Cruz, Jr.